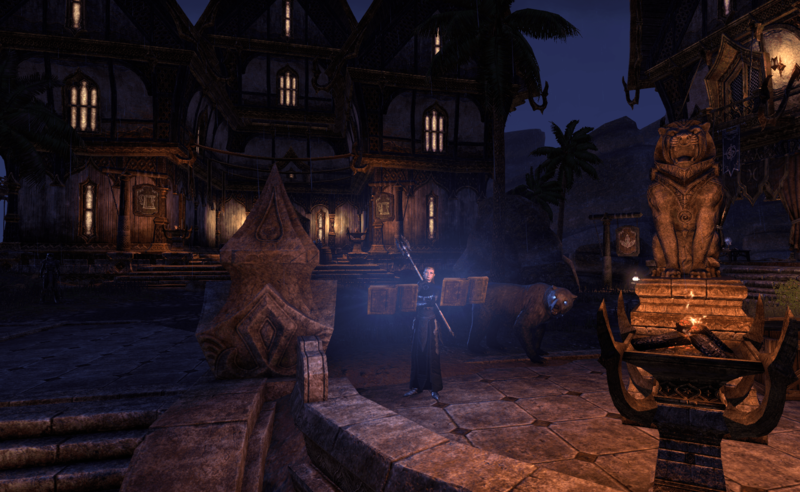 Yep, I’m still lurking in ESO. Something about Elder Scrolls definitely has me captivated. Magic, mystery, and a big fuzzy bear, what’s not to love right? Yes I’m also still rolling Warden. I’m not sure how long that’ll be the case, it really depends on what the new class coming with the upcoming Elsweyr expansion has to offer. I can’t wait to try it out and since I have the PTS loaded I’ll probably be doing just that. It’ll be yet another gold sink in bags and mount upgrades if I choose to actually keep it. As it is on my warden I have more skill points than I want to count. Mostly from sky shards but also from completing all kinds of quests. I even have both the Savior of Morrowind and Summerset on Isabeau. For me that’s a big deal. I’m a total slacker. Vinny, my partner in crime is still running around with me and we’re getting into no end of trouble here and there. He re-rolled Warden and picked up Werewolf. He seems to be having a blast with it and it’s fun to have someone to run around with. Though honestly, I still do a lot of the quests and achievement grind solo. My mother still plays the game with us and we have a dedicated family game night. It’s not as easy with the time difference. For right now though it’s quite a bit of fun. We’re rolling three wardens and that makes life interesting. The will I won’t I on the necromancer is going to have to wait until I get a hands on chance to play the class. Without knowing how it plays it’s pointless to decide if it’s something I’m interested in or not. I can’t wait however for a new zone to explore, hopefully some new armor motifs to grind and… I really want to buy something from an Alfiq. It will be a squee worthy moment. As it is I’m really itching to try out a Vampire as well and I’m curious how a Vampire Necromancer would play PvE wise. From a lore perspective you’d be an utter abomination. The only way to make that worse would be rolling a Red Guard Vampire Necromancer. Not that it wouldn’t make room for the possibilities of one crazy dude or dudette. First though, it’s going to be a matter of slogging through dungeons to get a taste of the story before the open world bit lands. I’m not sure how I feel about that since I don’t like dungeons. I don’t mind public dungeons, but I never really got into doing dungeons. Since I actually have a sub again though, I can just dink around with them if I get the time. Well here’s to the beginning of the YEAR OF THE DRAGON! I just hope I don’t get eaten.